We offer turn key solutions for super phosphate plants, granulation plants, gypsum granulation plants. 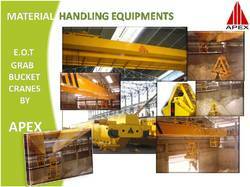 Rotary drums, screw conveyors, bucket elevators, material handling crane etc. Our customized designed and manufactured APEX Screw Conveyors are supplied as closed tube or trough version, depending on the requirements. They are installed for horizontal and inclined transport of power and other solids from industrial processes. 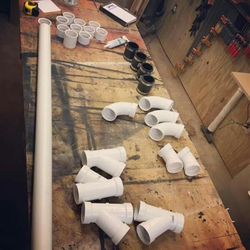 The entire process of material transport takes place within a closed tube or a lidded trough. The APEX Screw Conveyors are custom made for the individual product to be conveyed and designed and manufactured with state-of-the-art techniques. 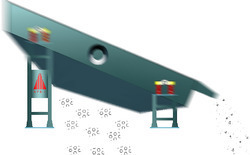 Due to their special design principle the conveyors can be equipped with either a push or pull drive and feed hoppers or discharges can be added if required. Direct screenings transfer from one to the other screw conveyor is no problem. APEX will provide the best solution for each customer to obtain the highest quality in the most efficient process – from powder handling to final cooled granules product. 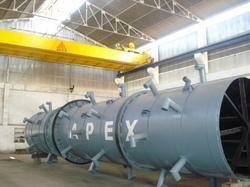 The ability to define the optimum particle size for the overall process makes APEX unique as a supplier of complete plants. The most suitable incoming material for the dryer is ensured, which again increases dryer efficiency. 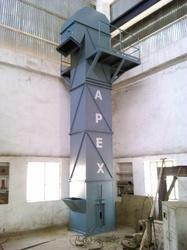 The interior of an APEX drier drums is designed to maximize the drying rate. The optimal relationship between falling time and resting time is chosen. 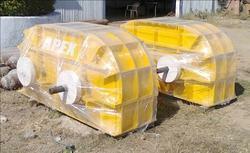 Best Quality Grab Bucket E.O.T Cranes by APEX. 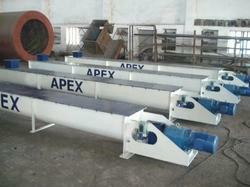 APEX offers you a wide range of Vibrating Screens. A reliable, efficient screen is not the only thing you need for optimizing your screening process. An efficient screen also needs efficient wear protection, dust encapsulation and screening media products. Our ELEGANT DESIGN of Vibrating Screens are cost efficient and 100% productive. Our Bucket Elevators are used for transportation of dry, granular and powdery materials and can overcome height differences up to 50 meters. These high efficiency cyclones are frequently used as product receivers, as precleaners to high efficiency dust collectors. 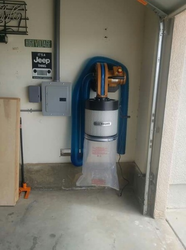 · Smaller outlet diameter. An increase in pressure drop also results. Efficiency and pressure drop are also affected by barrel length, outlet length, inlet configuration, and design of the internal cone. These factors are optimized to result in the maximum possible efficiency at a practical overall size and pressure drop. We manufacture and supply of Mild Steel Chimney, Industrial Chimney, Self Supported Chimney, Structural Chimney as per IS-6533 Standard. Designed with precision and to suit the clients exact requirements, Mild Steel Chimney is high on demand in the local markets. 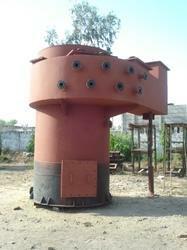 To suit the needs and demands of the clients, we make structural or self supported chimney. 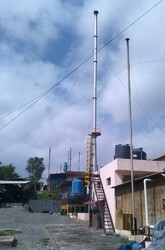 Moreover, we also provide erection and commissioning services for Mild Steel Chimney to the clients. We design, fabricate and supply a varied range of storage tanks. 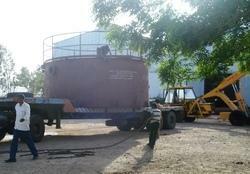 Our storage tanks are widely used in Acid, Fuel, Chemicals and Water uses. Ensuring hygiene and maintaining a sterile environment, products in these storage tanks remain free from contamination. * Inside & outside surface preparation with Sand Blasting as per SA 2.5 . 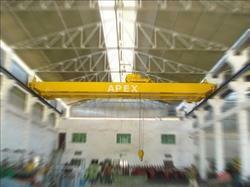 * Single girder under Running/Slung and Top running cranes. * Double girder under Running/Slung and Top running cranes. APEX forced draft (FD) fans supplying air to the furnace, and induced draft (ID) fans removing flue gas. Typically, the FD fans control airflow, while ID Fans control furnace pressure to slightly below atmospheric pressure. Wet Scrubbers are effective air pollution control devices for removing particles and/or gases from industrial exhaust streams. Wet scrubbers operate by introducing the dirty gas stream with a scrubbing liquid – typically water. Particulate or gases are collected in the scrubbing liquid. Wet scrubbers are generally the most appropriate air pollution control device for collecting both particulate and gas in a single system. Pollution Systems offers a variety of Wet Scrubber systems specifically designed for your process application. Many important operating variables are considered when evaluating the size and type of scrubber for any specific application. We will work with you and use our experience and knowledge to provide the proper solution for your process. Granulated Single Super Phosphate (GSSP) is manufactured by feeding SSP powder to the rotating Granulator drum the powder SSP is mixed with water which results in formation of granules from powder. The granules than discharged to the rotary dryer drum. The material comes from dryer are cooled in cooler drum. After cooling of the granules, granules are sending to the vibrating screened for desired mesh and packed in 50 kg HDPE bags for sale as GSSP. 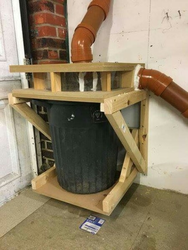 Furnace oil. Diesel / HSD etc. Meet all standards like BIS & others. State of art, trusted, proved & ecofriendly. Training of line and staff, spares & technical support. 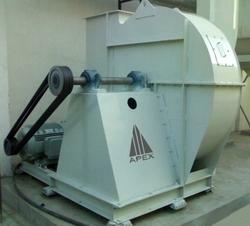 Apex double rotor chain mills are heavy duty mills which are specifically desined for breaking oversize granular materials efficiently and at high rates of production.